The House Edge is described many ways. Some people say it’s “A place to have fun” others say its “Disneyland for adults”. No matter what you think a casino is, keep this in mind. A casino is a business. They don’t have to cheat because except for Blackjack and Poker, every casino game has a built in profit on every bet. This is known as the House Edge or Casino Advantage. So what is this House Edge? 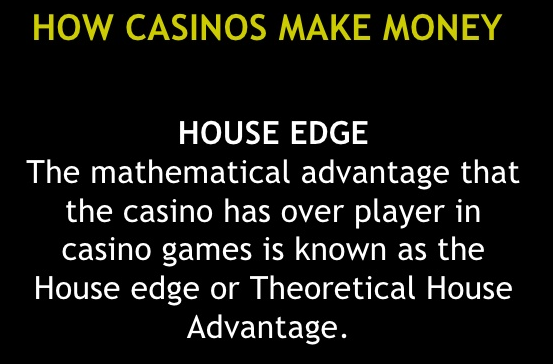 The House Edge for any game or group of games can be defined as “the ratio of all money lost by players to the total money they wagered.” Some prefer to think of it statistically as “the ratio of the average loss to the initial bet.” In either case, the resulting percentages are about the same. They provide not only a useful way of comparing one game to another but also of evaluating one set of rules versus another in the analysis of a single game. For an easy understanding of how the House Edge works, along with how rules changes can impact the odds of a player winning, the game of Roulette provides an excellent example. The European Roulette Wheel contains 36 numbers and a zero, for 37 possible outcomes in total. On any given spin, the payout for correctly choosing the winning number is 35-to-1. Consider for a moment a player who wagers one chip on every number on the Roulette table, including zero. That player would have to put 37 chips in play. No matter what number comes up, only one of them can win. In other words, the player must lose 36 of the 37 chips, while retaining just one of them (the winner) and receiving 35 chips for the correct choice. That’s 36 chips lost and 35 won for a net loss of one chip—which is a direct result of the House Edge in effect. To express this as a percentage, the average loss (total loss) of 1 chip is divided by the initial amount of the bet (total wager) or 37 chips. That makes the House Edge = 1/37 = 2.70%. It doesn’t matter how many times this betting pattern is repeated; the result will always be the same—an expected loss of 2.7% built in to the game. This is the House’s advantage for this form of Roulette. It is not, however, the only version played. Although the payout is the same, 35-to-1, owing to the addition of a double zero the American Roulette Wheel has 38 numbered slots, not 37. If all 38 numbers are wagered upon with a chip apiece, all but one will be swept away with the losers. The win is still worth only 35 chips, meaning the net loss will now be two out of 38 chips, and the House Edge goes up to 2/38 = 5.26%. Remember all this when you visit any casino ... all of them want your money which you should give them with a smile on your face.